Inspiring the future generation of birders, nature enthusiasts and/or general nature lovers is vital in sustaining our wonderful wildlife and habitats. In my opinion, the most powerful asset at our disposal is utilising the right people to provide platforms for engagement. New nature bloggers and campaigners such as the wonderful Dara McAnulty and the determined Findlay Wilde are brilliant advocates for the next generation of naturalists; acting as catalysts for others their age to take an interest. “There is a great deal of fulfilment found in encouraging young people to take an interest in nature and birds in particular. As far as I’m concerned this is the most rewarding way to give something back to birding and through providing enthusiasm and inspiration, the foundations for future birders are laid. 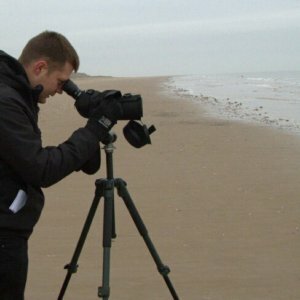 Sometimes I ponder whether the more ‘serious’ birders who are competitively listing, ever stop in their hectic twitching schedules and show a young person actually what it is that all the people clad in pseudo army fatigues are pointing their big lenses at. Don’t get me wrong, I love to be in a bird hide on my own but if a family walks in behind me and an excitable child clambers up onto the bench then the last thing I want to do is ‘tut’ and make them feel uncomfortable. I don’t think anyone should apologise for a child’s enthusiasm and inquisitiveness and I will always go out of my way to converse with them, tell them what I have seen and offer them the use of my optics if they so wish. In fact, this happened when I was a ‘guide in a hide’ at Pensthorpe at the aforementioned event. Pensthorpe is a managed wildlife park with many captive birds (predominantly wildfowl) and a lovely scrape at the far end of it. A scrape is just as it sounds, the land has literally been scraped and then backfilled with water in the hope of attracting birds to it. Scrapes make an enticing stop-off point for migrating wading birds and wildfowl and as they often have islands or spits within them, they can provide a place of refuge and safety. The hide in question was one of two, both of which look like little boxes wrapped in parcel paper from a distance. I sat and surveyed the scrape – it was crammed full of birds yet incredibly tranquil. I lowered my spotting scope a little and zeroed in on a Little Egret that was strutting along the reed fringe in front of me, “have a look at this” I said. One of the boys came over, followed by the next “wow that’s cool”; the other looked, “it’s a white heron”. I commended him for his reasoned guess and I turned round, gesturing for both to look at the board on the wall. I asked them which one they thought it was, they both looked and mulled it over, then both simultaneously pointed at an image of a Little Egret. I gave them much commendation for their correctness and then as children invariably do, they lost interest and made to leave. “Thanks for that” said the ‘father’, “my pleasure” was my honest reply. Thanks, Joe, for your valuable thoughts and work. I’ve just found your blog; it’s a great thing to have created. It’ll be very useful regarding some local mental health work here. Another way for kids to be interested in birds, is the feather. Compared to mammalian hair, feathers are incredibly complicated and varied pieces of kit. They are strange too. Quite honestly feathers feel odd to the touch – there’s something a bit alien about them. And then, when you tell a child that dinosaurs were the first animals to have them, you’ve sown a whole world of spreading images. Deep time, rocks and the idea of ‘living, feathered dinosaurs’ – children love such connections. Hang on, adults do too, don’t they? And then on another day the conversation could turn to ‘feathered apes’ – Professor Nicky Clayton’s term for her intelligent and problem solving corvids which she studies. Again this sort of mixing up of words and ideas grabs kids and enthuses them.